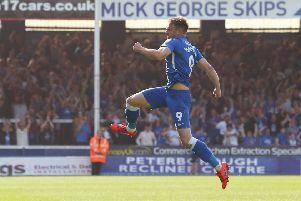 Peterborough United manager Steve Evans has challenged his players to set off on another winning streak. Posh saw a club record start to the season of five wins in a row come to an end last weekend when Doncaster took a point away from the ABAX Stadium following a 1-1 draw. They now travel to a Southend side crippled by injuries, suspensions and international call-ups on Saturday (September 8). The Shrimpers had 12 players unavailable for Tuesday’s Checkatrade Trophy win over Cambridge United. But Evans is taking no notice of Southend’s lengthy absentee list. He’s expecting the usual tough encounter at Roots Hall. “Winning five games in a row is extremely difficult,” Evans said. “It won’t happen very often, but if you win three games in a row often enough you will go close to promotion. “We will go to Southend full of confidence because we are top of the league. I can’t get too interested in any problems they have. I know they will field a side with many top players and they will be well organised by an outstanding manager. “It’s always hard to win at Southend and Posh have a poor record there so we are under no illusions about the task we have. But we have the greatest incentive of all to get a win. If we pick up three points we will still be top of the table on Saturday night and that’s the best place to be. Posh will be without midfielder Callum Cooke. He twisted his ankle in the early stages of Tuesday’s game at MK Dons and faces three weeks on the sidelines.